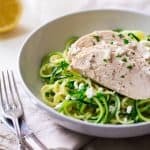 Chicken is marinated in Greek yogurt, chia seeds and lemon juice, baked and served over zucchini noodles for a quick, easy and healthy weeknight dinner! And, really, that is far as my brain is going right now. It’s one of those dreaded days of WRITERS BLOCK. Or it could be because I just woke up and I haven’t had my coffee. But, I have come to the place of accepting that I am only ever going to be a normal human once coffee is running through my veins. I also don’t know if I’ll ever be normal. So, there’s that. But this post is not about ya’ll trying to get all deep, INSIGHTFUL and trying to figure out the inner workings and human nature of Taylor. Whatever that means. It’s about chicken. And zucchini noodles, and a creamy, 6 ingredient sauce that tastes like Spring time just hit you square in the MOUF. Also, lemon CHIA SEED. I bet you expected lemon and POPPY SEEDS amIright? 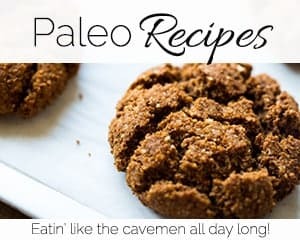 Remember the Paleo Egg Muffins? It’s ALL about the plot twists here on FFF. I just like to keep ya on your TIPPY toes. 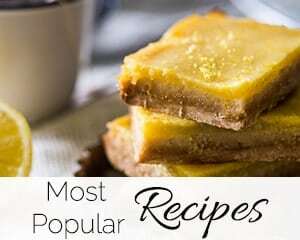 Have you noticed that I go on recipe binges? 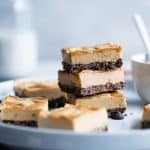 Like, only a couple weeks back, we had those Slow Cooker Energy Bars, which was the first recipe EVER to have chia seeds. And then chia seeds are rearing their black and REALLY small little heads AGAIN today. But, they’re really fashionable and trendy right now. Like dogs in purses. Which should have never been fashionable EVER, if you’re wanting my opinion. Why is this post all over the place? 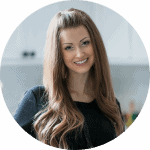 For so long, I only thought of chia as those totally creepy little heads that grow “hair.” They really didn’t come in my radar as something that makes me go “NUM.” Until, you know, I actually tried using them. And clearly, we are now eating them in ALL DA FOODS. The rest of this SUPER DUPER FULL of healthy YUM dinner is SUPER DUPER simple. 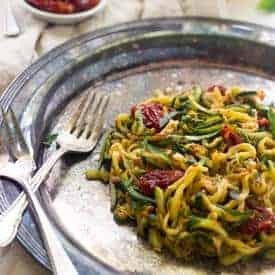 Once that’s done, a few cranks of a spiralizer is all you need to make some zoodles. Pop that chicken on top, hit ‘er with some more lemon juice, parsley and Feta cheese <– Don’t skip that. Now, look at your plate and feel like you’ve just created the fanciest dinner EVER in abouuuut 30 mins. It’s SEWWWW fancy, you should even have a white wine cocktail with it. 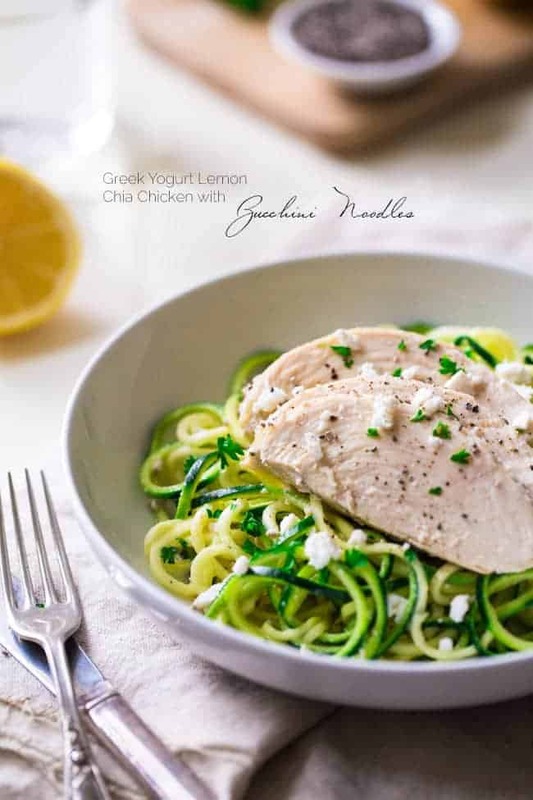 I also shared the Greek Yogurt Lemon Chia Chicken recipe on Melanie Makes. So be sure to check it out there as well! In a medium bowl, whisk together the Greek yogurt, 3 Tbsp of lemon juice, honey, Chia seeds, 1 tsp Olive Oil, garlic and a pinch of salt and pepper. Place the chicken into the bowl and spoon the mixture over-top so it is well covered. Cover the bowl and refrigerate for at least 2 hours. 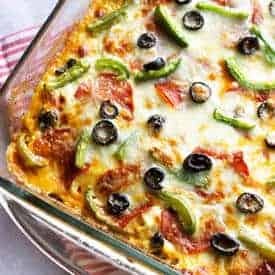 Once the chicken has marinated, heat you oven to 350 degree and pour the chicken, along with the yogurt mixture into a small baking dish. Bake until the chicken is no longer pink throughout, about 25-30 minutes. Cover and set aside for 5 minutes to let the meat rest. 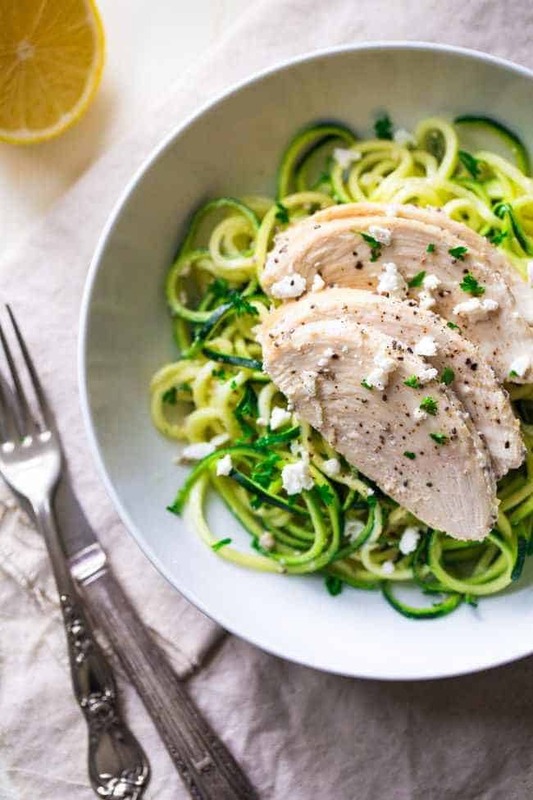 While the chicken cooks, spiralize the zucchini noodles using the 3mm blade of your spiralzer (you can also use a mandolin if you don’t have a spiralzer.) 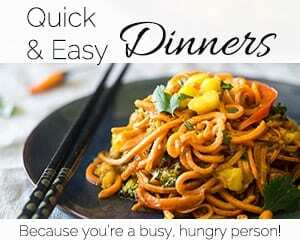 Place the noodles into a strainer and set over top of a medium bowl. Lightly sprinkle the zucchini noodles with salt and let strain for 30 minutes to release the water, stirring around every so often. Squeeze out as much remaining liquid from the zucchini noodles as you can and place into a bowl. 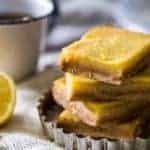 Drizzle with a little bit of olive oil and squeeze of fresh lime juice. Toss to evenly coat and divide between two plates. 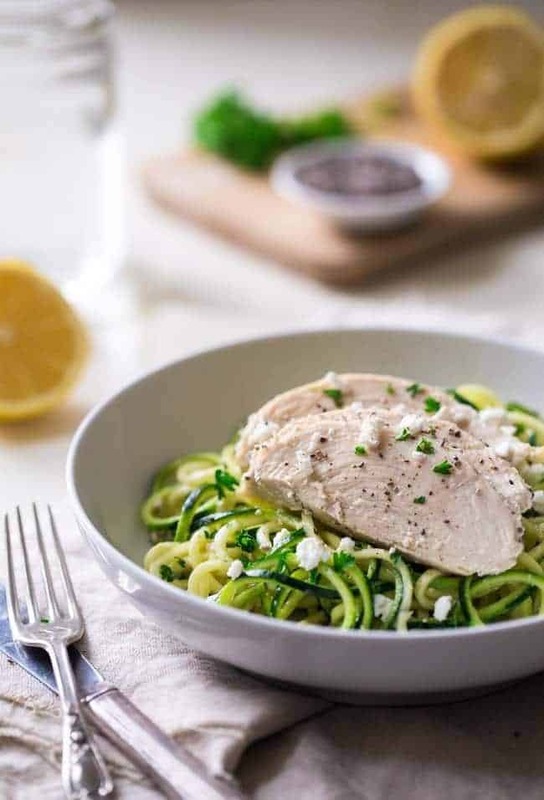 Place the chicken on top of the zucchini noodles and whisk the sauce until it begins to come together (it will be a little clumpy) divide the sauce over top of each plate. 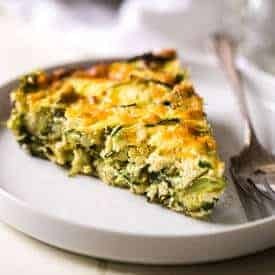 Sprinkle with feta cheese, parsley and DEVOUR. that marinade for the chicken sounds delicious- I’d totally sacrifice the seeds being stuck in my teeth for them. The spiralizer is back again. I knew you wouldn’t mind a few seedsies in your teeth. And yes. And I am not even sorry about it. Thanks dudeeeee! ((((sharing))))) and in to try as we love our ZOOOODLES HERE. We do too! SO YUM! Thanks for the share Carla! You are the queen of spiralized noodles, Taylor! Love it! 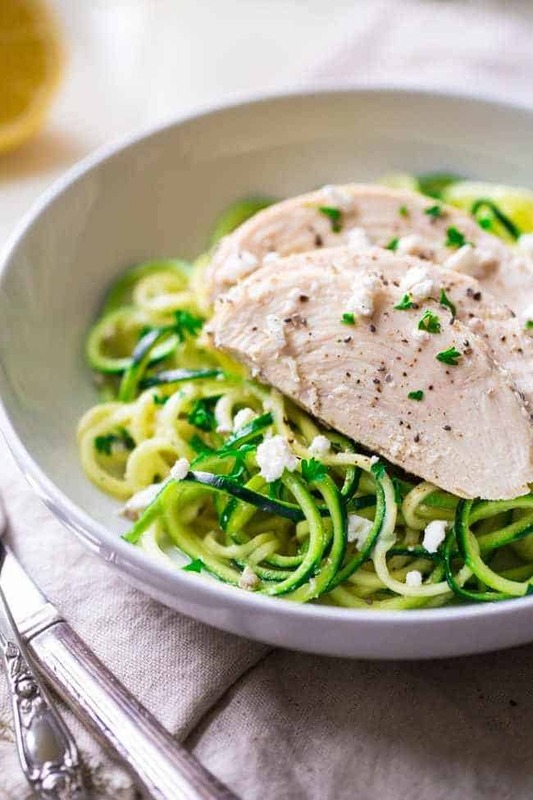 This chicken and zucchini noodles go so perfectly together. And that lemon chia dressing looks amazing! Pinned! I seriously love them so! It makes eating veggies SO MUCH EASIER! Thanks so much for the love and pin Gayle – have a FAB wednesday! I love the chia in the marinate/baking sauce Taylor! Never tried anything other than pudding and drinks. 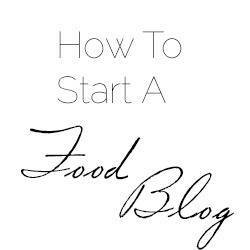 I am so into the idea though and will have to try it. You totally need to! 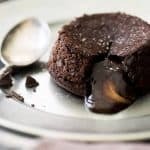 I am actually not too much into the chia pudding, but it’s super yum in a savory application! Thanks lady! ME TOO! Especially with the warmer weather rolling around! 2 bowls is the only way to eat this. You’re a smart girl 😉 Thanks chica! I can totally see myself making this for dinner all of the time. Usually, I work at Starbucks on Monday nights and don’t have time to whip up dinner. This would be a great thing to make Sunday afternoon and have for leftovers during my busier days. YUM! Totally! The leftovers are SO GOOD! 🙂 Thanks Erin! 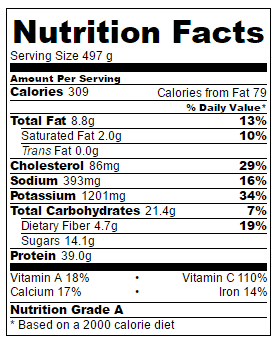 I have yet to try chia seeds in any food! Do I have to do it just because everyone else is? I tend to go against the grain instead of with it. But I must say that this lemon chia chicken looks pretty darn tasty. 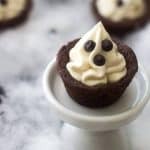 I may have to sneak a bite, or a whole serving! Haha, I am usually with you. I eventually try it…but am WAY late to the party! Thanks Jen! I need this chicken and those noods. Obvi. !! Oh gosh. You and me both. It’s like here. Eat this. DONE. 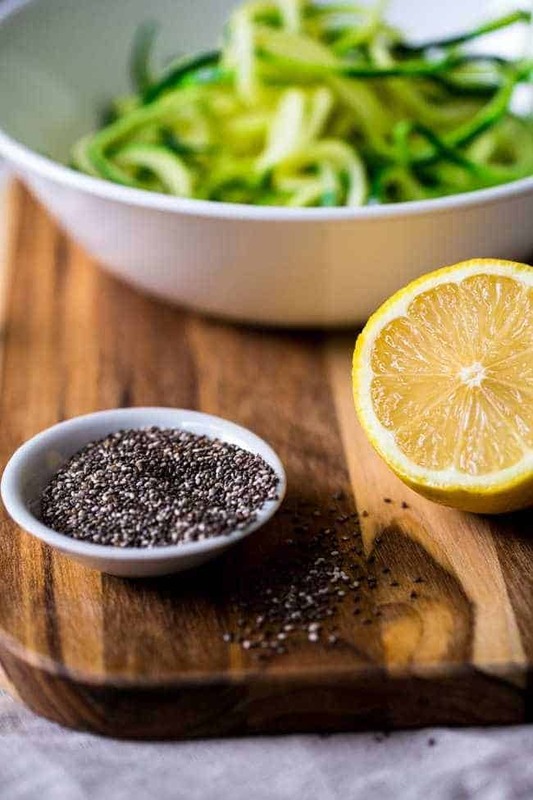 Love the chia seeds and the zoodles! Such a healthy meal. 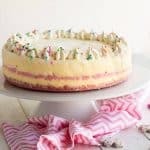 Looks delicious and so perfect for spring! 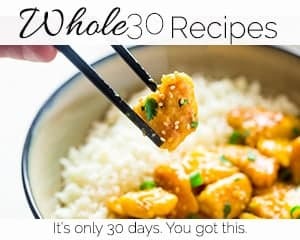 Love this recipe and how you crusted the chia seeds on the chicken.. yum! Haha, I am glad you don’t judge the crazy! Thanks Krista! I am SO jealous. It’s been rainy in Seattle….obvi. 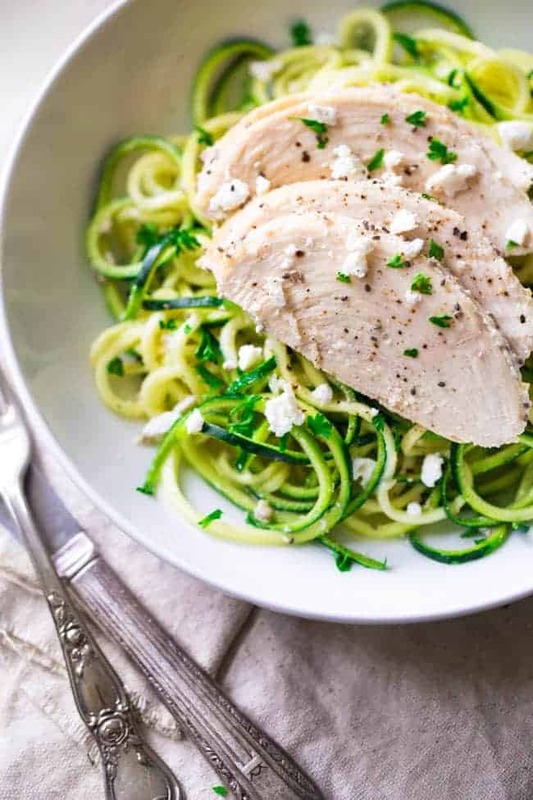 Okay..I seriously need to get a spiralizer! This looks amazing! DO IT. You 100000% will NOT be disappointed!! Thank you Cathleen! the pet is weird right? Thanks babe! Omg!! That lemon chia greek yogurt chicken Taylor!!! 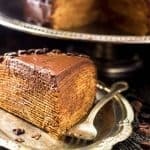 I am drooling all over this dish! Thank you Ami! I hope that continues if you make it 😉 Happy Wednesday! RIGHT. It was my April fools joke! Which was unplanned by whatever! Girl, I feel you on the whole writer’s block!! It would be so much easier if we could just Do a photo, caption, and recipe. Either way, this chicken looks absolutely beautiful. Love the chia seed addition. 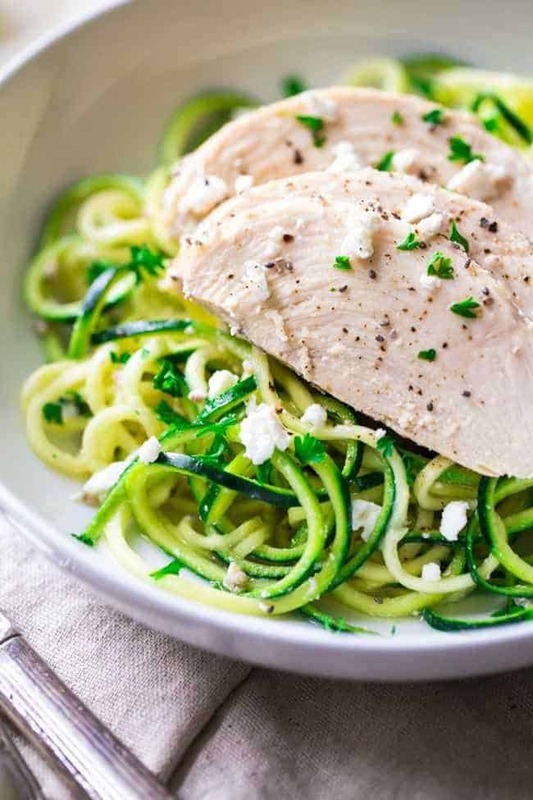 I’m in love with zucchini noodles and yours look perfect! 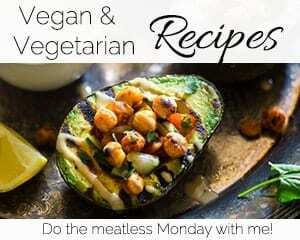 Great pics Taylor, can’t wait to make this yummy, healthy recipe! You and me both girl! Thank you!